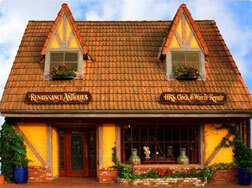 Serving a Worldwide Clientele in Solvang Since 1974. 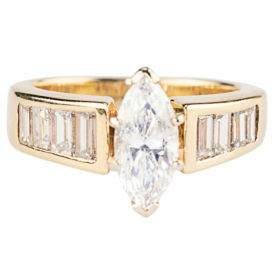 This elegant ring features a 1.0 carat marquise cut center stone framed by eight baguettes, four on either side. 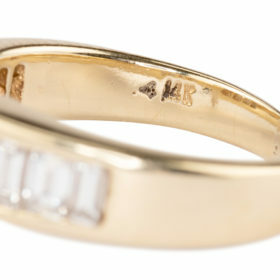 The center stone is I in color and VVS2 in clarity. 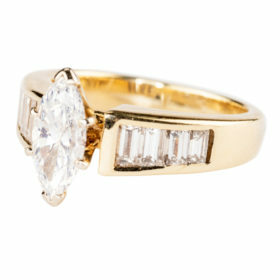 The baguettes total .64 carats and are channel set with a rating of G in color and VS1 in clarity. The ring it set in 14K yellow gold. If you would like to purchase this item or learn more about it, please click on the Inquire link above or phone the Renaissance Showroom at 805-688-1976, open seven days a week from 10 to 6.